Former Scrappy Shortstop of Early Nineties Now Teaching Game. Norman Elberfeld, the "Tabasco Kid," feared no man's spikes when he played short for Detroit and New York Above he is shown getting Ty Cobb in the dirt at second in his playing days. Below he is shown teaching two of his pupils how to bat. Cleveland, O. May 18—Back in the early '90s they called him the "Tabasco Kid." Then Norman Elberfeld was known as the scrappiest shortstop in baseball, and he gave the umpires a large pain in the neck with his volcanic arguments. But how the guy has tamed down! He's now a staid old professor! The "Kid" is conducting a baseball school, teaching the young sprouts of the country just how the game should be played. He arrived here recently after holding sessions in Memphis, Charlotte and Cincinnati. And let it be said right now that if he is teaching the boys to play as he played the game, they might as well start wearing boxing gloves on the field. Elberfeld played shortstop for Detroit and the Yankees in the early '90s. When his team arrived in any city of the American League circuit, it was a signal for the boys back in the country to hitch up their buggies and traipse into town—for they enjoyed a good fight as much as a ball game. The little whippersnapper, now an easygoing soul, loves to reminisce about those old days. He recalls how the boys of the opposing team would sharpen up their spikes when he rolled into town, and he bears many scars from spike wounds received after verbal scrimmages with opposing players—and many an opposing player has carried the Kid's marks to his grave. 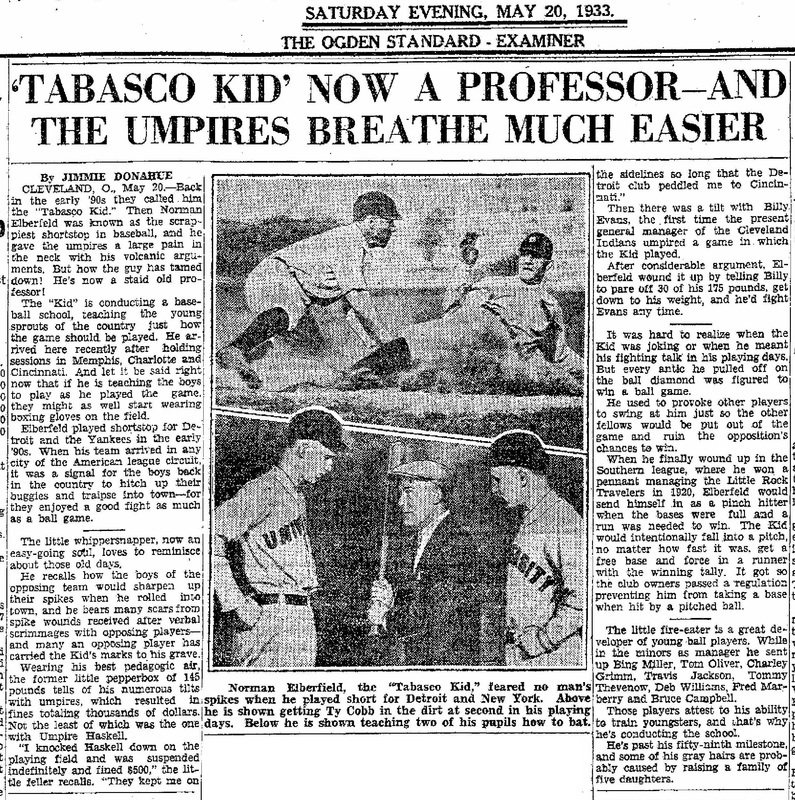 Wearing his best pedagogic air, the former little pepperbox of 145 pounds tells of his numerous tilts with umpires, which resulted in fines totaling thousands of dollars. Not the least of which wads the one with Umpire Haskell. He knocked Haskell down on the playing field and was suspended indefinitely and fined $500, the little feller recalls. "They kept me on the sidelines so long that the Detroit club peddled me to Cincinnati." 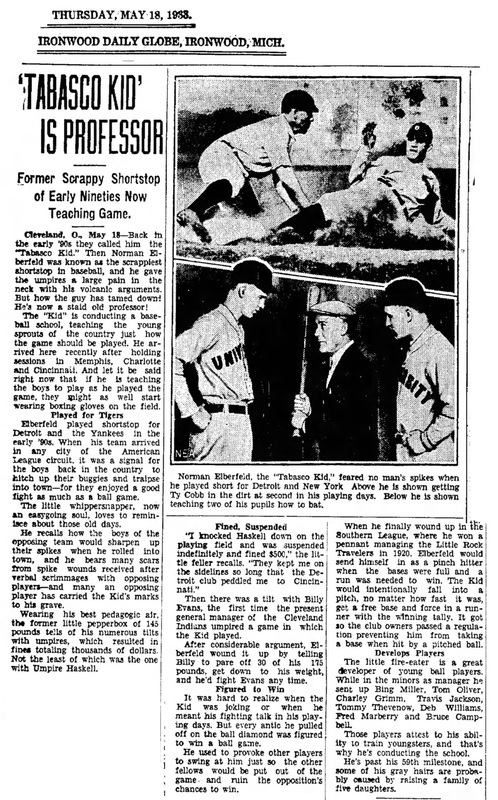 Then there was a tilt with Billy Evans, the first time the present general manager of the Cleveland Indians umpired a game in which the Kid played. After considerable argument, Elberfeld wound it up by telling Billy to pare off 30 of his 175 pounds, get down to his weight, and he'd fight Evans any time. It was hard to realize when the Kid was joking or when he meant his fighting talk in his playing days. But every antic he pulled off on the ball diamond was figured to win a ball game. He used to provoke other players to swing at him just so the other fellows would be put out of the game. and ruin the opposition's chances to win. When he finally wound up in the Southern League, where he won a pennant managing the Little Rock Travelers. in 1920, Elberfeld would send himself in as a pinch hitter when the bases were full and a run was needed to win. The Kid would intentionally fall into a pitch, no matter how fast it was, get a free base and force in a runner with the winning tally. It got 30 the club owners passed a regulation preventing him from taking a base when hit by a pitched ball. The little fire-eater is a great developer of young ball players. While in the minors as manager he sent up Bing Miller, Tom Oliver, Charley Grimm, Travis Jackson, Tommy Thevenow, Deb Williams, Fred Marberry and Bruce Campbell. Those players attest to his ability to train youngsters, and that's why he's conducting the school. He's past his 59th milestone, and some of his gray hairs are probably caused by raising a family of five daughters. This is the same article but with a better headline.